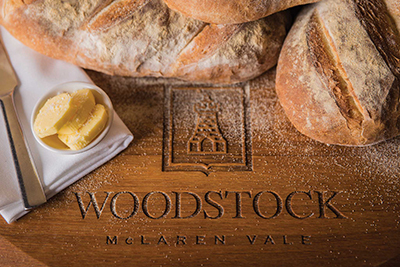 If you go down to the century old gum trees at Woodstock, you’re in for a treat at the Coterie thanks to Executive Chef Chris Bone. Calling all fans of the energising beach walk in winter – don’t finish your stroll with a trip to the local takeaway, let superb local fast food come to you instead! Coffee with heart and art is what you will find in this delightful little café in Crafers. Sit a while by the fire and leave yourself time to browse the gallery. Chocolate + wine = you? 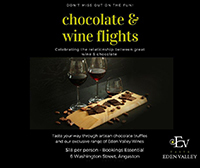 Indulge yourself with a seat by the fire at Taste Eden Valley and let yourself be beguiled with a Wine and Chocolate Flight, complete with an insight into the wines of the Barossa and Eden Valley from the people who know. Bookings essential. 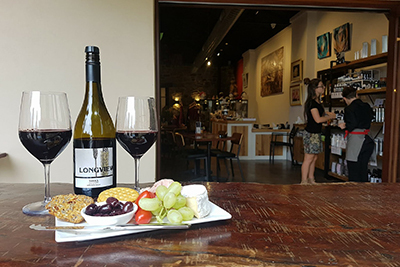 Sip & Sounds at the National Wine Centre on 22 July is the new face of what used to be the Winter Food and Wine Festival, combining all the best in local wine and music, building on the success of The Glass House pop-up during the 2018 Adelaide Fringe. Oh, the pressure to get to grips with the best dish of the day, especially when you are only visiting and can’t easily return to work your way systematically through the whole menu. Who needs it? If you like your food (and we do), every so often dining indecision will freeze you like a rabbit in the spotlight while the waiter stands, pen poised… waiting. Maybe you’ve spotted the chef’s selection. Is that the easy way out that means you might miss out? Not these days. In fact, it might be the best decision you’ve made in a while. Eat Local SA recently popped in to Leonard’s Mill Restaurant in Second Valley, where the new(ish) management have set themselves the significant challenge of sticking within a 17km radius for suppliers and don’t decide their weekend dinner menu until late on Friday, after the kitchen garden has been plundered and local producers have all been visited. One day, they tell us, they’d like to have no menu for dinners at all. Just a freewheeling invitation to their place, to taste what’s utterly perfect, presented the very best way the chef knows how. With the Fleurieu Peninsula as their larder, you know you are on to a good thing. 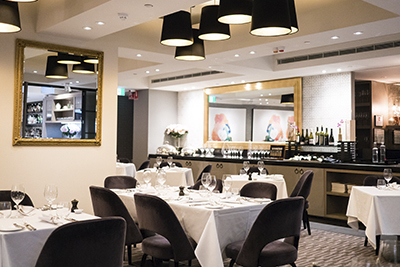 At The Olfactory Inn, it’s simply called the ‘Feed Me’ option, while at the Botanic Gardens Restaurant, the team forage daily through the gardens and tweak the day’s menu accordingly when they get back to the kitchen. At Topiary, they refer to the menu at their café as ‘hyper-seasonal’ because it changes every couple of days. They can’t seem to help it. All the better for us. A chef with a larder full of produce at the peak of perfection and an open invitation to play is an inspired chef. If you are in the mood, it’s a chance to get inside the chef’s head and palate in a whole new way, and it’s bound to bring you a new experience with the very best local ingredients. Isn’t that what you feel like eating? 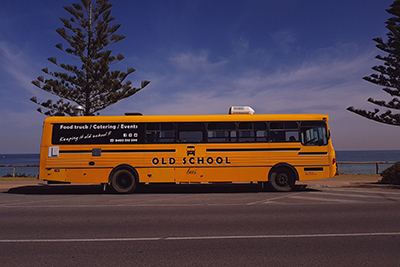 Well you know where to look to find those chefs – yep, on your Eat Local SA app with the handy ‘near me’ function, or on our website.